The new government will have to address numerous junta-era land grabs, such as in Ayeyawaddy Region’s Pantanaw Township where hundreds of farmers lost land. PANTANAW, Ayeyarwady Region (Myanmar Now) – As darkness fell in Khanwebo on the night of February 3, a sudden ruckus erupted when dozens of policemen entered the coastal village in Ayeyarwady Region. They were looking for farmers locked in a long-running land dispute with a local company. A scuffle ensued as angry villagers confronted armed police and one was allegedly stabbed by a police rifle mounted with a bayonet. “I felt warm under my left armpit. 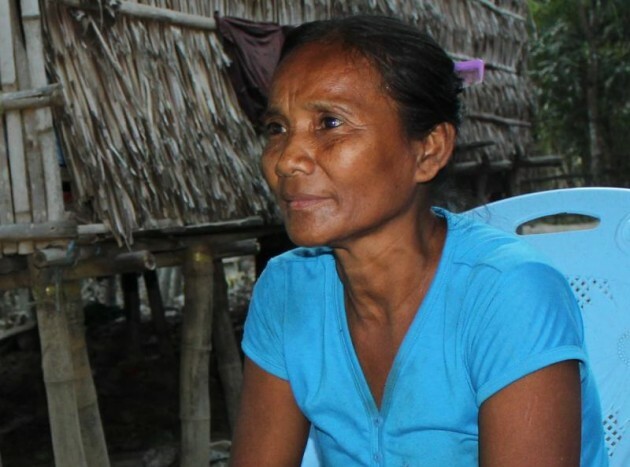 I realised I was cut only when I saw blood there,” Win Kyaw claimed. The police operation was one of several rounds of recent arrests of Khanwebo villagers who are reclaiming land they once farmed. Khanwebo, Kyatkhattaw and Khattiya are three poor villages in Ayeyarwady Region’s Pantanaw Township affected by a large land dispute involving several thousand farmers and Phoe Lamin Company Ltd. The firm was granted control over some 2,800 acres of land by the former junta government 16 years ago. The land dispute in Pantanaw Township is one of Myanmar’s largest and the tensions and unresolved conflict here are representative of the land issues that have affected farm communities across the country. During the former junta, huge tracts of farmland were seized for army and government projects, or given to well-connected ‘crony’ companies. Myanmar’s democratic transition of recent years has created political space for farmers to protest and reclaim their land, but this rise in activism has often lead to a confrontation with authorities. For the incoming National League for Democracy (NLD) government resolving the widespread land disputes and amending land laws to better protect farmers will be a key issue during its term. Than Shin, 49, a Khanwebo community leader, said he lost about half of his 15 acres of paddy field to Phoe Lamin Company. In a type of protest that has become increasingly common in Myanmar, he and hundreds of farmers went to plough farmlands controlled by the firm in mid-2014. “We have owned these land for generations, so we are fighting to get them back,” he said. The company filed a complaint and police subsequently charged 19 community leaders, including Than Shin, with trespassing, theft, and damaging property – criminal charges that carry punishments of up to several years in prison. He has evaded arrest so far. Villagers are on the lookout for approaching police and have even organised a night watch to avoid further arrests. Than Shin said the land dispute has taken a heavy toll on the villagers, pushing them deeper into poverty and affecting their sense of security. “Many girls have left and are now working as the housemaids, or as labourers in garment factories in the cities,” he said. The farmers allege police are acting to protect the interests of Phoe Lamin Company and have made hundreds of arrests across Pantanaw Township in the past decade to crush resistance against the land grabs. “Locals could not avoid confrontation with authorities as they suffered a great of loss of income and unfair police actions,” said Kyi Soe, a 40-year-old villager. Capt. San Yu Naing, an officer at Khanwebo Village Police Station, said farmers had violated the law through their ploughing protest and should face punishment. “The villagers tried to illegally trespass on the company’s land…the company has an official land use permit,” he said. San Yu Naing strongly denied police used rifles mounted with bayonets in the village in February. It is rare for Myanmar security forces to use such lethal force against farmers, though soldiers were photographed deploying such weapons to quell a protest over a large land dispute in Sagaing Region’s Kantbalu Township in 2014. Kyin Nyein, managing director of Phoe Lamin company, said his firm obtained the land with permission from high-ranking military officers in the year 2000. “The land use permit was personally approved by former General Thura Shwe Mann,” he claimed during an interview at the company’s office in Khanwebo Village, referring to the former parliament speaker and ousted Union Solidarity and Development Party (USDP) chairman. In recent years, Phoe Lamin company returned about 2,300 acres to villagers to address their complaints, but it remains embroiled in conflict over another 500 acres under its use. Land rights activists and the NLD have long called for a return of seized lands and changes to Myanmar’s land laws, which provide little legal protection of land ownership. President Thein Sein’s quasi-civilian government and the previous USDP-dominated parliament undertook some efforts to this end. The Land Utilisation Management Central Committee, a governmental body formed in 2013 to resolve land disputes, received a total of 17,718 complaints and managed to resolve 1,065 cases through the return of land or by offering financial compensation, according to a recent state media article. A new National Land Use Policy was drafted late last year and its introduction will be an important task for the incoming NLD government. Ruling party lawmakers said they were determined to improve land rights during their term. Hines said that the NLD government should set a moratorium on granting new land use permits to firms until such a law is in place. *This article was first appeared on Myanmar Now on 29 March, 2016.